Friday night I went back to one of my favorite places: Colorado Bend State Park in Texas. It is to the West of the Austin area, and well isolated. You can’t even get a cell phone signal out there, which is nice. I have been there before shooting the waterfalls and the night sky. 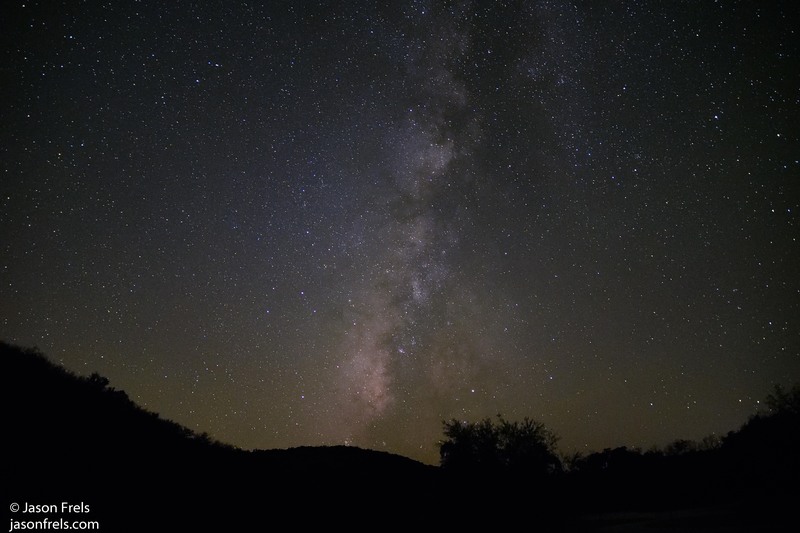 On a clear moonless night, there is almost no light pollution and you can see all of the stars. It’s an amazing sight for a lifelong city-dweller like me. The last time I went to take night sky pictures was in January. It was very cold which is good for night sky photography as that makes the air dry and clear. And my main goal at that time was to take a long sequence of shots to stitch in to a time-lapsed movie, which I posted in an earlier blog. But, in January the Milky Way is not prominent in the night sky, so I wanted to go out there again on a dark evening before it got too close to Winter again and see the galaxy. I was not disappointed as it was a clear evening and after twilight, the moon wouldn’t be up for hours, and it was so dark that I couldn’t even make out the ground under my feet. There was no city glow on the horizon to drown out the stars. 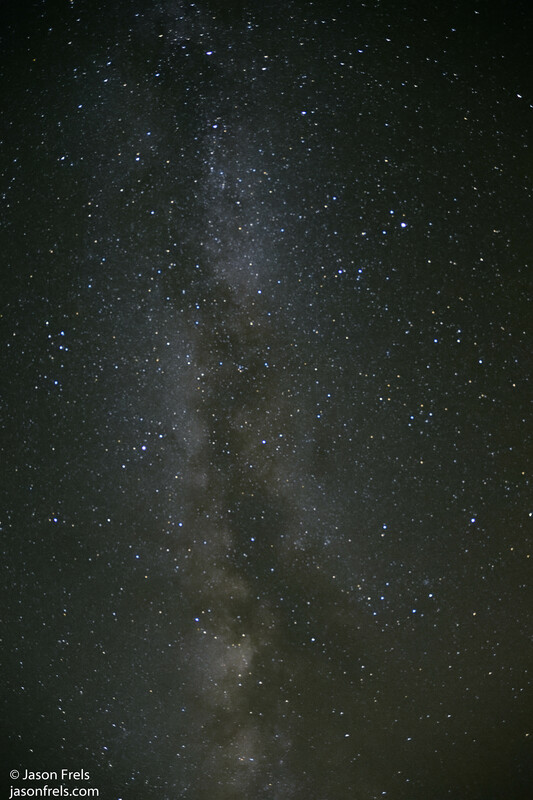 Looking up I could clearly see the Milky Way stretched across the sky from West to East. It is such an amazing sight, in this era of cities of light, that I just had to sit back and take it all in. It’s just so easy to forget that this is all up there over our heads all the time, billions and billions of stars. To try to capture this with my camera was my objective. I had my Nikon D5300, a 16-80mm f/2.8 lens, a tripod, and remote shutter release. I settled on 15 – 20 second exposures with ISO3200. I enabled long exposure noise reduction, which makes every image take twice as long. I have heard others say not to bother with it, but it seems to be worth the trouble to me. The first picture is pointing North. 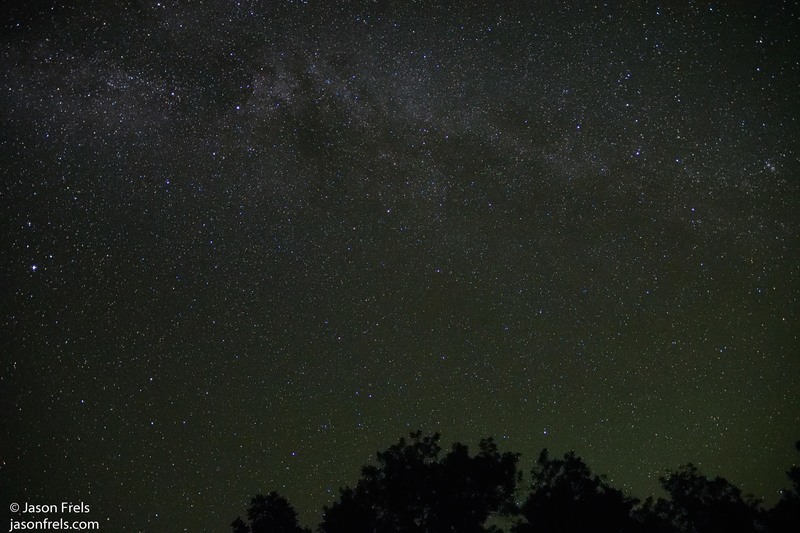 You can see the Milky Way in the image above the trees, but it was most prominent on the Western horizon. This picture is pointed straight up to capture the galaxy, though it has no landscape in the image to give it perspective or context. This picture is of the Western horizon and is my favorite of the evening. The Milky Way is over the horizon. Notice how dark the trees and hills are on the horizon; there was no ambient light, it was all stars! The trouble that I have with all of this is post-processing. Not something that I have had a lot of success with. Setting up the camera to take the pictures is not that difficult other than working to get a good focus, but figuring out how to edit the pictures is where I am challenged. I was advised to use a Nikon app called Capture NX-D. So I downloaded that and messed around with levels and curves, noise reduction, etc. I also tried Lightroom and made a mess of things with that. I will be working on this in the future. Very cool !! I can’t wait to go somewhere really dark one clear night. Generally involves going a long way from town in the middle of the night.